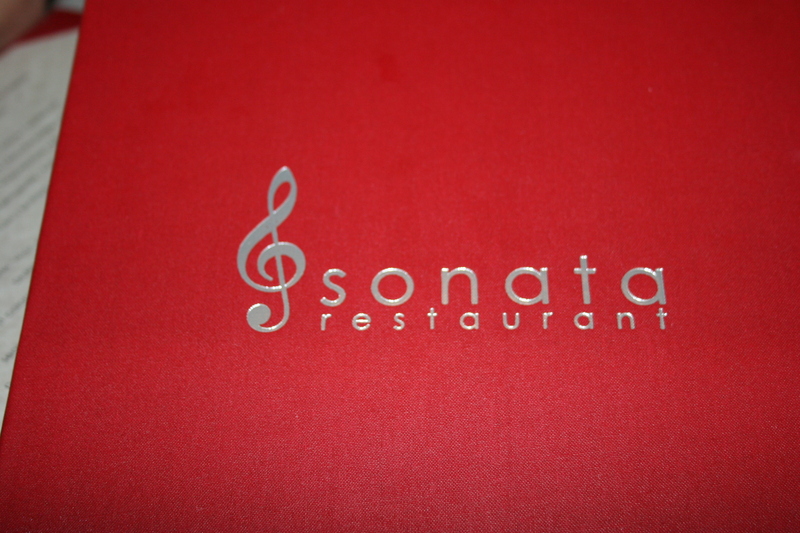 Quite honestly, until I made our reservation a few weeks ago, I had never even heard of Sonata. I was searching for a place in the Northern Liberties section of Philly and I stumbled across their website which, by the way, is very well done. 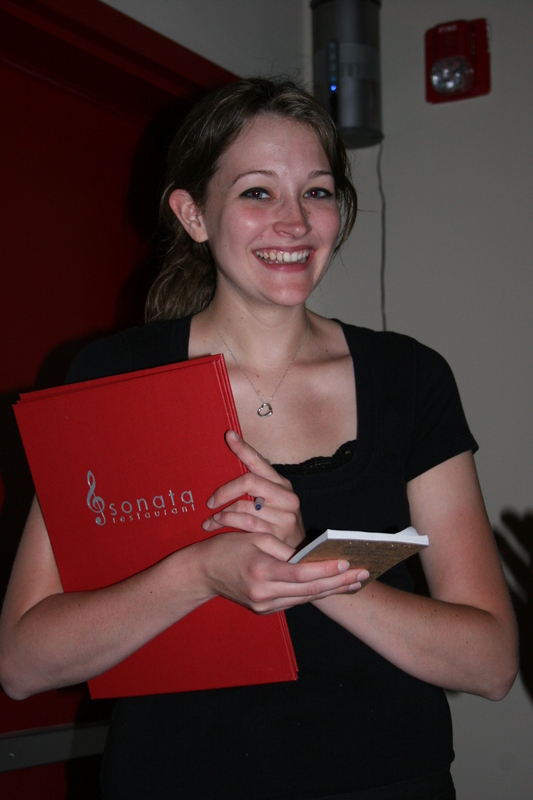 Once the reservation was made I started reading reviews on Sonata. They were overwhelmingly positive. The more I read the higher my expectations grew and I couldn’t help feeling I was going to be disappointed. I was not! 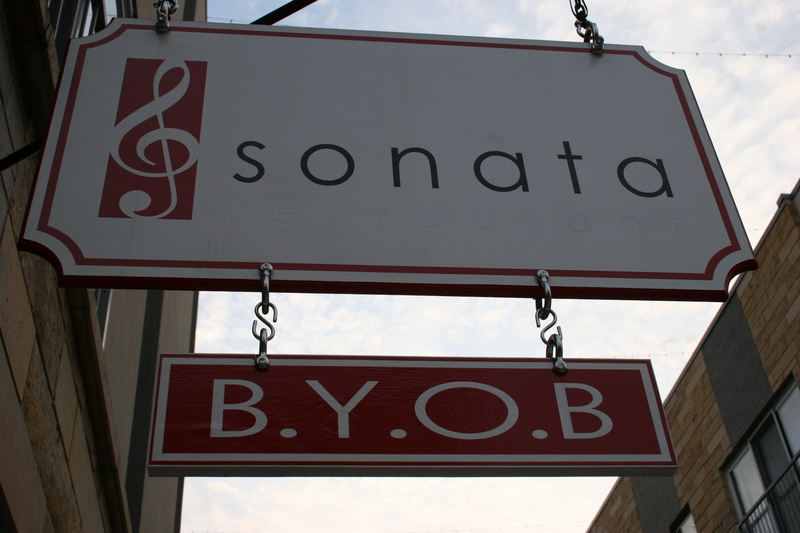 Sonata is a great BYOB. 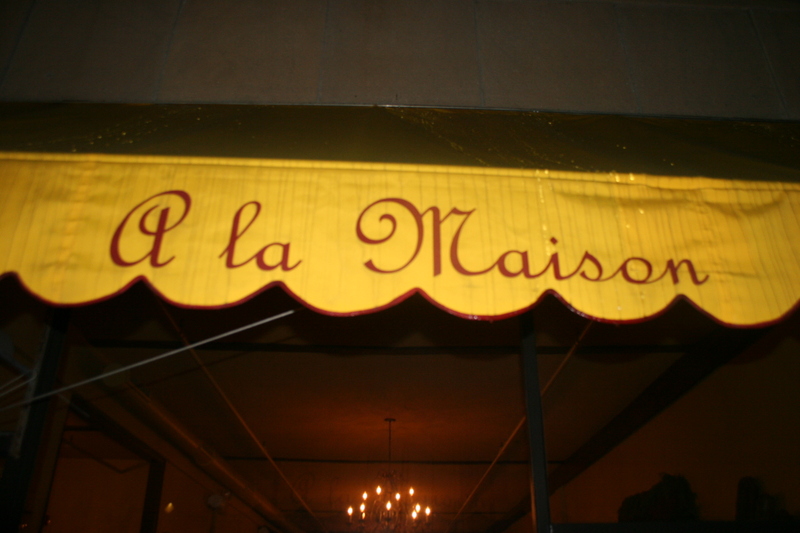 From the moment we walked in, when our server, Kate, greeted us enthusiastically, opened our wines, brought us additional glasses and was there to field any and all questions with a killer smile, I had a hunch it was going to be a good evening.. There were six of us in attendance, My wife, Kathy, and myself, our lifelong friends, Gerry and Joann B. and their neighbors, Tim and Linda G.
Sonata has a roomy feel as the tables are spaced nicely providing an open feel. The decor is simple with musical wall decor keeping with the theme of the place. There is outdoor dining in the busy Liberty Walk plaza. 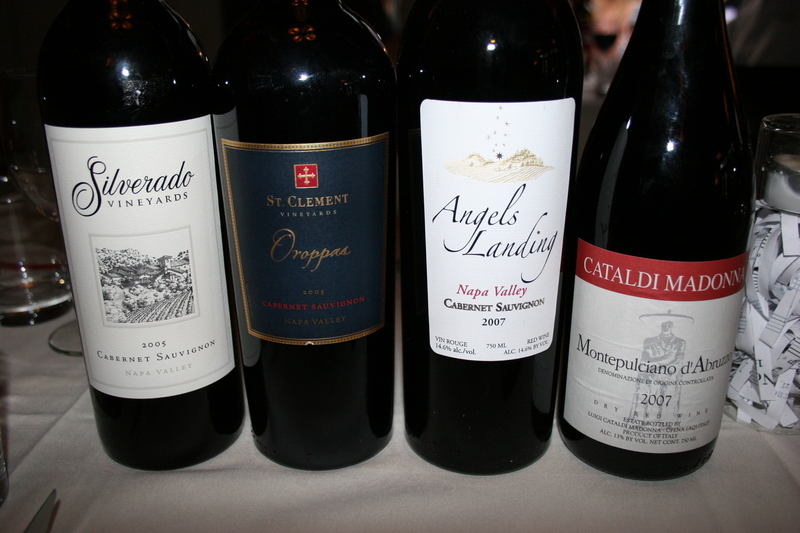 We had some great wines with us to enhance our meal. My wife had some interest in trying a Montepulciano d’ Abruzzo so I had a 2007 Cataldi Madonna, Montepulciano d’ Abruzzo, this 100% Nebbiolo wine was the lightest of the group and went well with some of the fish and seafood entrees. My other wine was a 2007 Angel’s Landing, Napa Valley, Cabernet Sauvignon. This checked in at 14.6% alcohol and had an unusual nose of rose petals, lavender and forest grass mingling with the blackberry and currants. 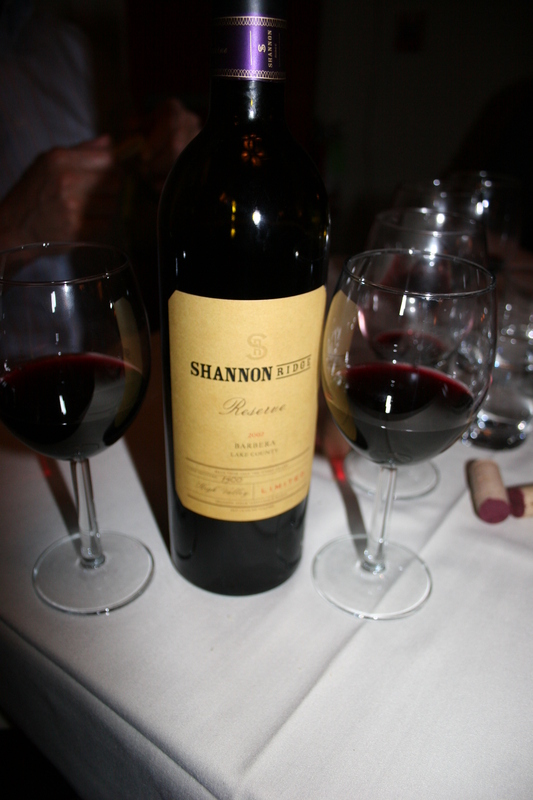 It had a smooth mouthfeel and I felt it was the best of the night despite being outpriced by Gerry’s two wines. His first was the 2005 Silverado, Napa Valley, Cabernet Sauvignon. The familiar Silverado “clove” was present along with rich currants and licorice and some dark chocolate highlights. Silverado seldom disappoints. His other wine was a delicious meritage, the 2005 St. Clements “Oroppas”, Napa Valley. Primarily Cab with a small amount of Merlot, the “Oroppas” got 91 points from Parker and I would concur; a very nice wine. Tim and Linda, who were a little late in arriving and had to fight the “find a parking space battle” just as we did, had with them a current PA State Store Chairman’s Selection, the 2007 Shannon Ridge, Reserve, Barbera, Lake County, CA. The Barbera grape doesn’t ripen until late in the growing season and this gives the wine a tangy, strawberry zest that provided a nice option to the rest of our cabs. Meanwhile, back at the menus, mouths were watering as we contemplated our choices. We all started with one of the many tempting appetizers. 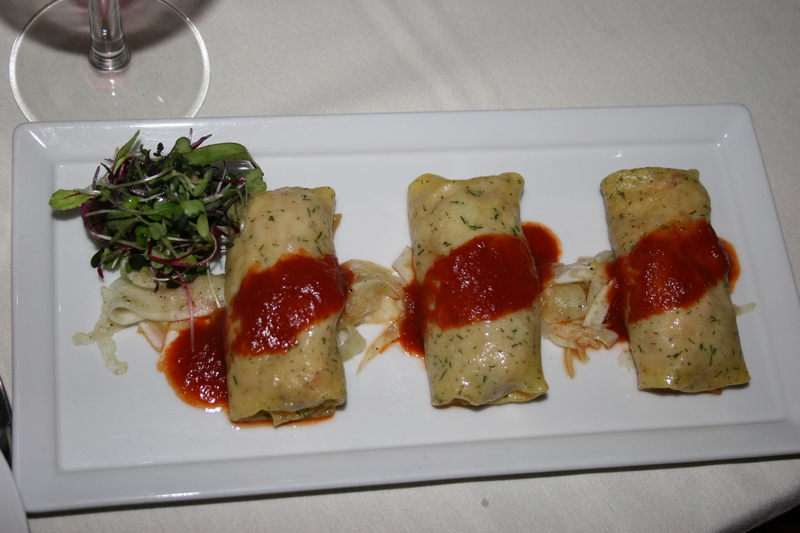 Joann chose the lobster crepes / fennel / mascarpone / lobster glace . The three crepes were nicely presented and having had a taste I can tell you they were excellent. 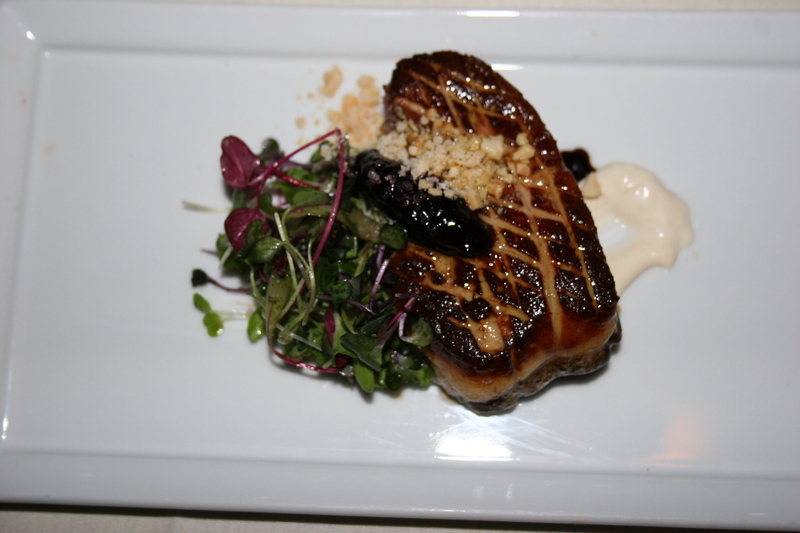 Gerry had the seared foie gras / preserved black currant / brioche puree / cashew crumble. He declared it was right up there with the best foie gras he has had anywhere. That seems like pretty high praise. 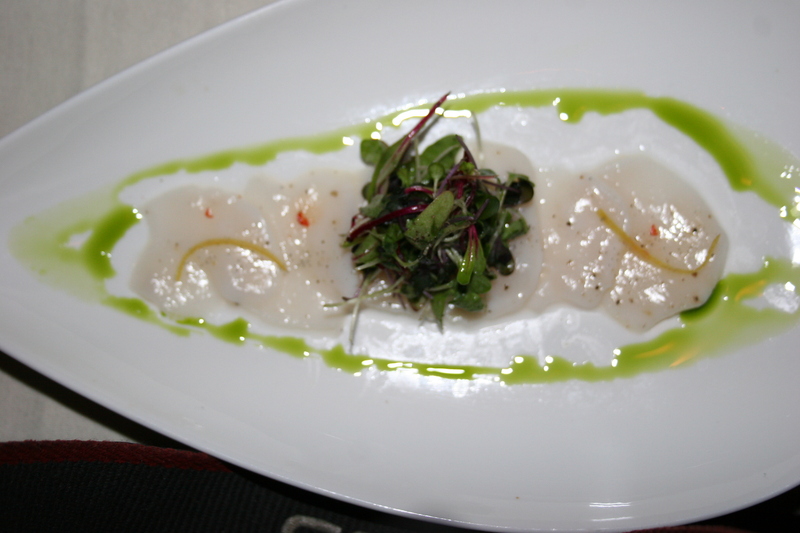 My wife ordered the scallop crudo / preserved lemon / chive / vanilla salt. It was nicely presented with delicate thin slices of scallop. She thought the lemon was a nice topping but it just wasn’t her favorite way to have scallops. 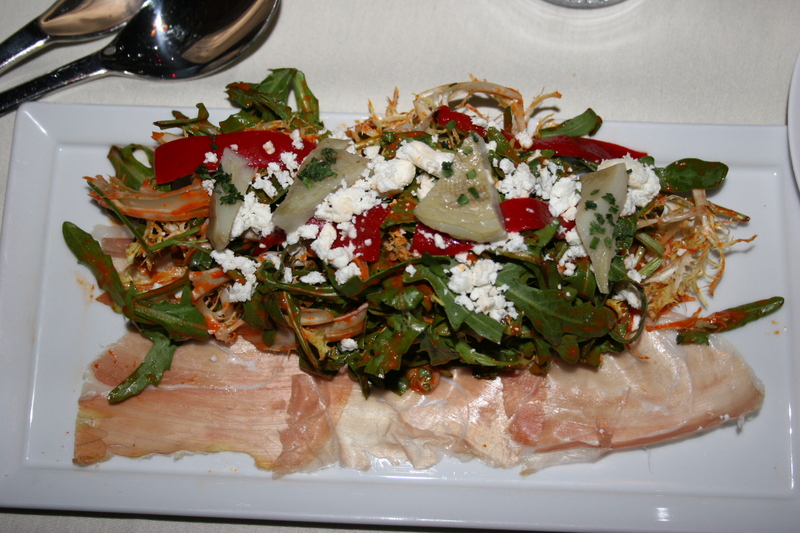 Tim and Linda both selected the frisee and arugula salad / serrano ham / braised artichoke / piquillo pepper / shellbark goat cheese. It was alos nicely presented and they both seemed to enjoy it. Personally, I have had my last frisee. I realize it may be the latest rage in garden greens but it just doesn’t work for me. It’s too rough and hard to swallow. I certainly had no complaints about my appetizer choice. I had read so many glowing reviews about the pork belly at Sonata that even though I had never had pork belly before I was determined to break that streak here and now. 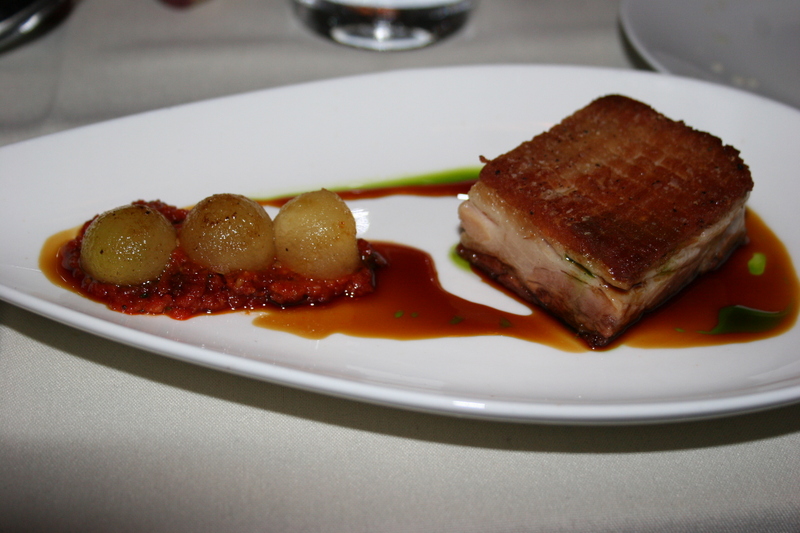 The crispy pork belly / smoked tomato marmalade / compressed apple/ calvados molasses was wonderful. The combination of tastes and textures was perfect and for me this was the perfect beginning to the meal. 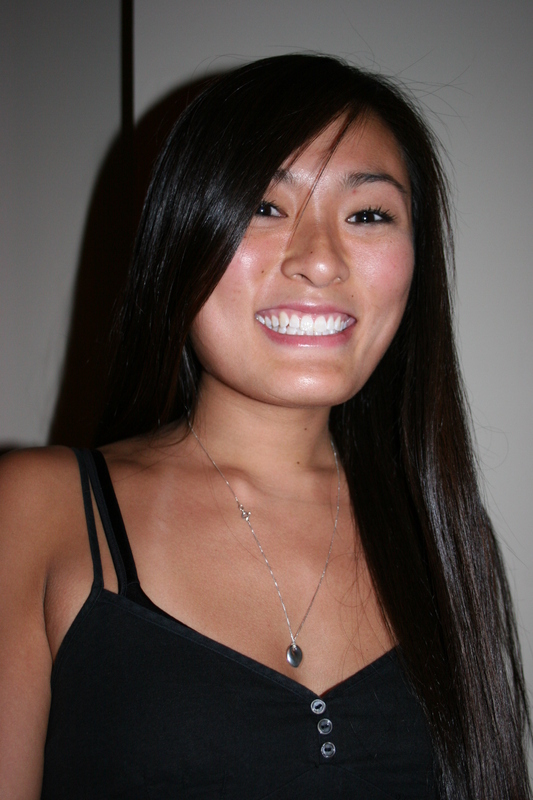 Throughout our dinner, the lovely Alex was assisting Kate and making sure our water glasses remained full and that we were enjoying our Sonata experience. You could tell from both of them that they felt a pride in the restaurant and truly cared that each diner was taken care of in a personal manner. 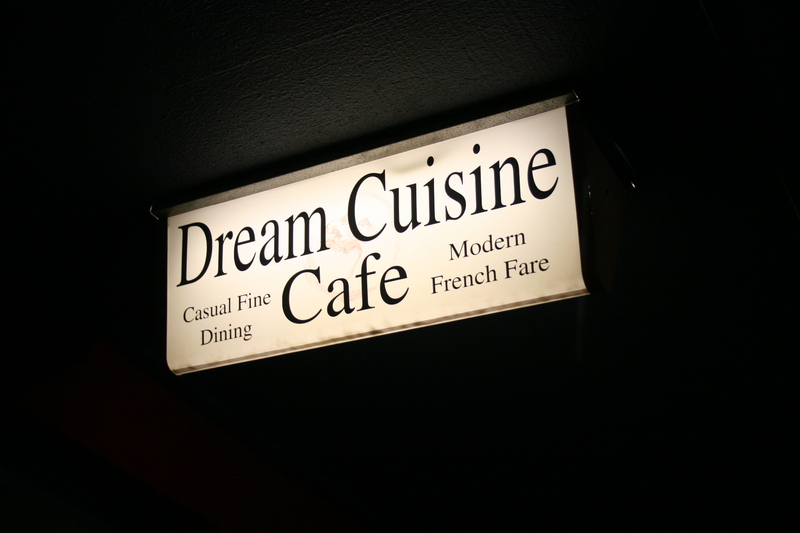 Selecting just one item from a menu where everything sounds so enticing was no easy chore. Joann never hesitated from her first choice and had the butter poached lobster “mac and cheese” / fresh paparadelle noodle / fontina cheese. Nice pieces of tender, perfectly done lobster in a rich sauce. She shared a small portion with me and it was really excellent. I had mentioned to my wife that in reading the reviews there had been more than one person that declared the salmon at Sonata to be the best they had ever had in any restaurant. That was enough to have her try it as she really enjoys nicely prepared salmon. 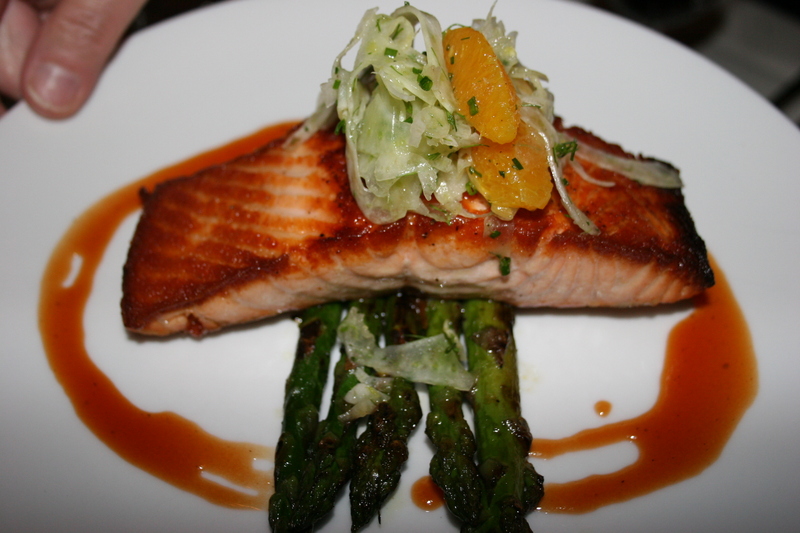 The seared salmon / grilled asparagus / fennel orange salad / blood orange vinaigrette was attractively presented and Kathy thought it was excellent although not the absolute best she has ever had. 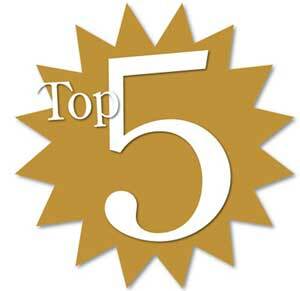 Hey, nothing wrong with finishing in the top three! Gerry was torn between a couple of different entrees and he purposely waited to see what I was going to order. 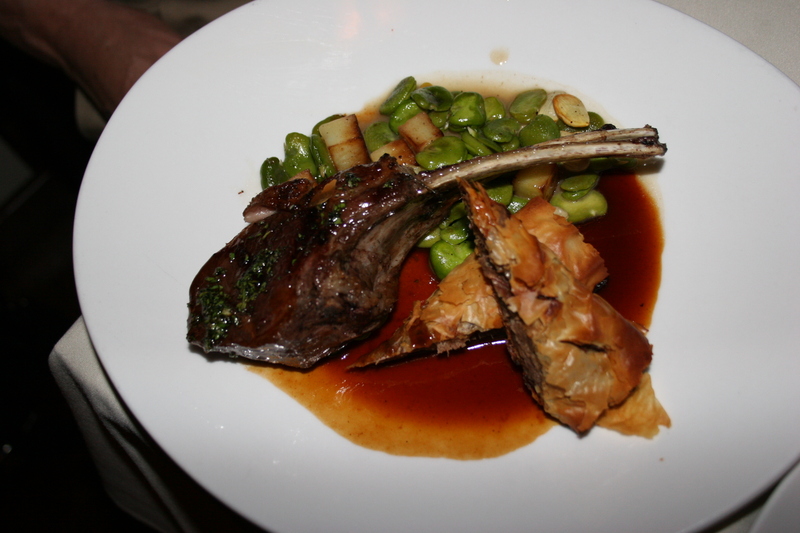 Once I settled on the chicken he went for the double-cut colorado lamb chop / braised lamb shoulder strudel / fava bean / potato / baby almond. The dish looked perfect and Gerry thought it tasted the same way. I could not have been happier with my choice. 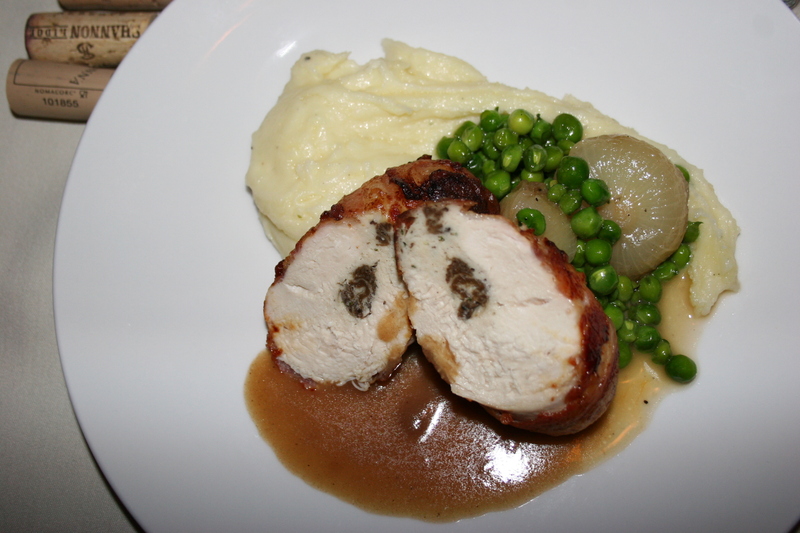 The pan roasted bacon wrapped chicken / boursin whipped potato / english peas / glazed cipolini onion were like a dance team who had worked together to perfect their steps. The chicken was tender and full of great flavor. The onion provided a nice addition to the mouth-watering potato and although I previously had never met a pea that I liked, I can no longer say that. The peas were amazing. You could have won a sizeable wager from me prior to last night that I would ever write the words “the peas were amazing”! If you are thinking that the handsome young man pictured here was the guy who valet parked our cars, you would be totally mistaken. 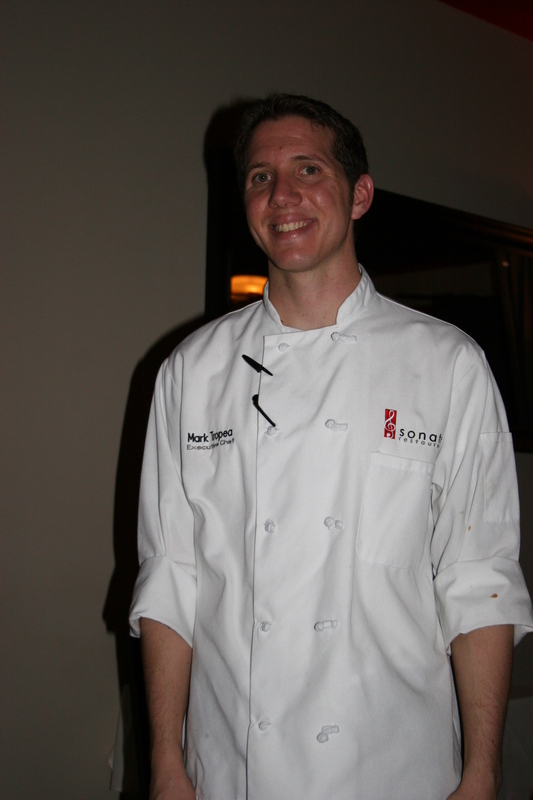 Mark Tropea is the guy responsible for not only the “amazing peas” but the amazing meal. A 2002 graduate of the Restaurant School, Mark is creating culinary classics on a nightly basis at this soon to be discovered Northern Liberties location. It’s obvious from the presentation and food quality that Mark knows what he is doing. He makes sure that he visits every table to insure their satisfaction with the meal. 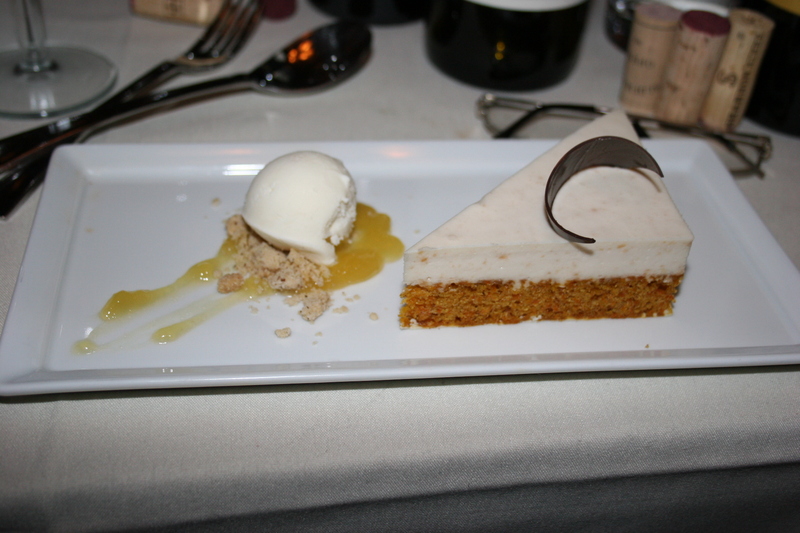 Not only are the entree and appetizers first class, the desserts are equally wonderful. 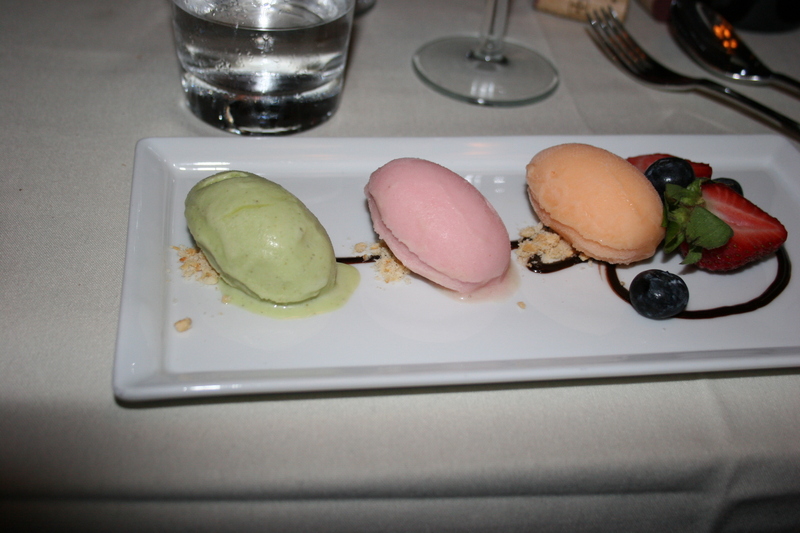 They are light and flavorful and the perfect ending to your meal. 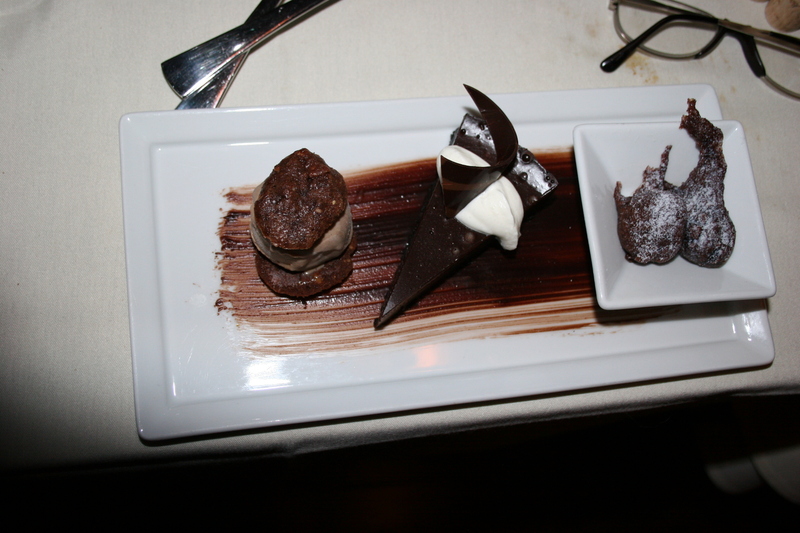 Pictured above are our dessert selections. A trio of sorbets; carrot cake / coconut mousse / pineapple sauce / cream cheese sorbet / spiced walnut crumble and something called chocolate decadence / warm chocolate beignet / chocolate hazelnut “chipwich“ . All were delicious. 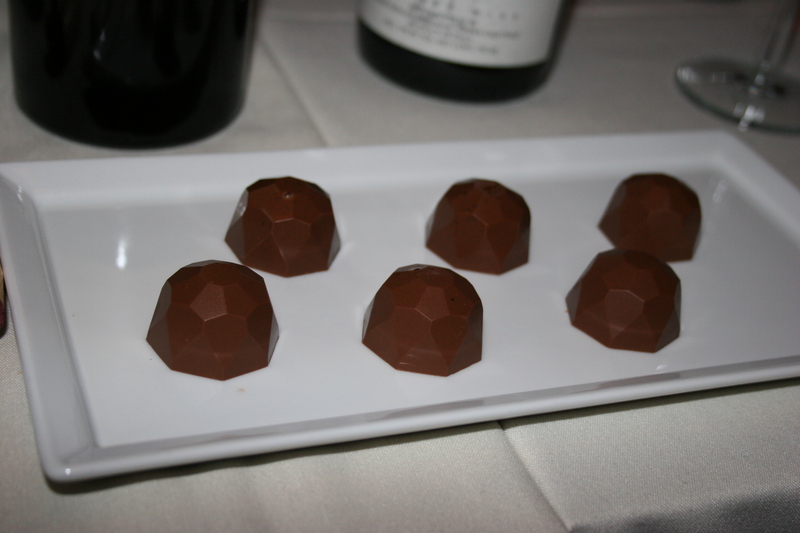 As a final note we were presented with some complimentary chocolates just in case the desserts didn’t fully satisfy our sweet toothes. As you may have guessed, the chocolates were “melt in your mouth” delicious. 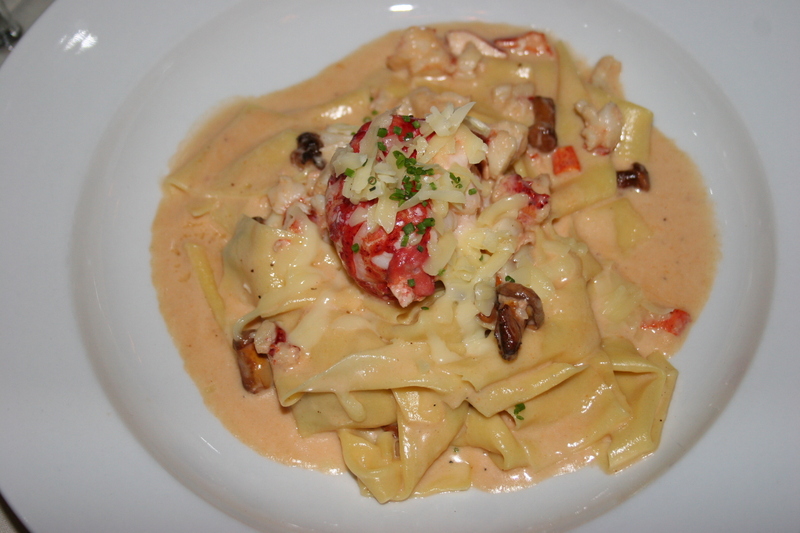 As I mentioned at the start of this review, I went to Sonata with high expectations. That is not always a good approach to anything. Expectations are not always met. Sonata came through. It’s an excellent BYOB and I am sure we will be back. 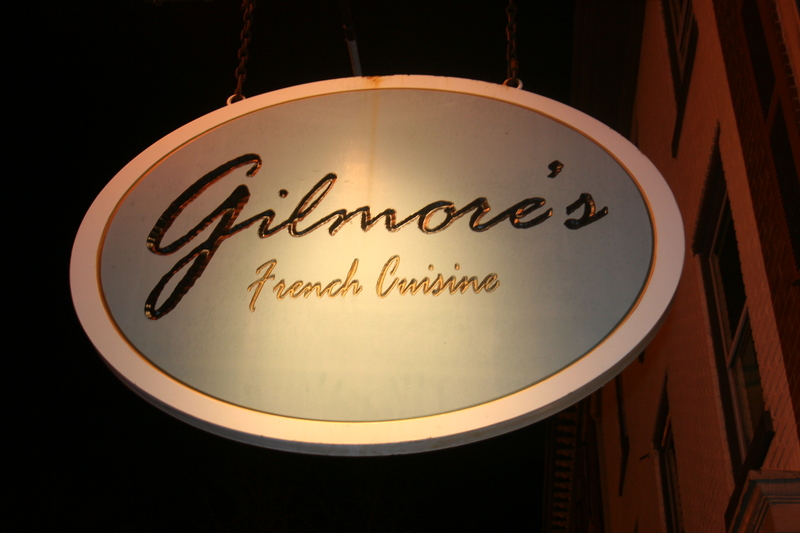 The real trick, from what I have seen, is meeting expectations when you bring the next group of friends that have heard you rave about a restaurant. My guess is that Mark Tropea and Sonata will be able to meet those high expectations.